Mental Health UK is a network of four charities across the UK who provide more than 400 services to support those affected by mental health issues. With one in four of us experiencing a mental health problem in any given year, it’s so important that there are networks providing the support needed to help people improve their mental health. Lloyds Bank have partnered with Mental Health UK to develop and launch a service where both mental health support and financial services can be provided together. Those who experience poor mental health often struggle with their finances, and similarly those who struggle with their finances can then experience poor mental health, so this service will provide the help required to manage both aspects. Our fundraising is going towards ensuring this combined service reaches as many people as possible across the UK, and we’re so pleased that at this January event we managed to raise another £100 to help make this happen! 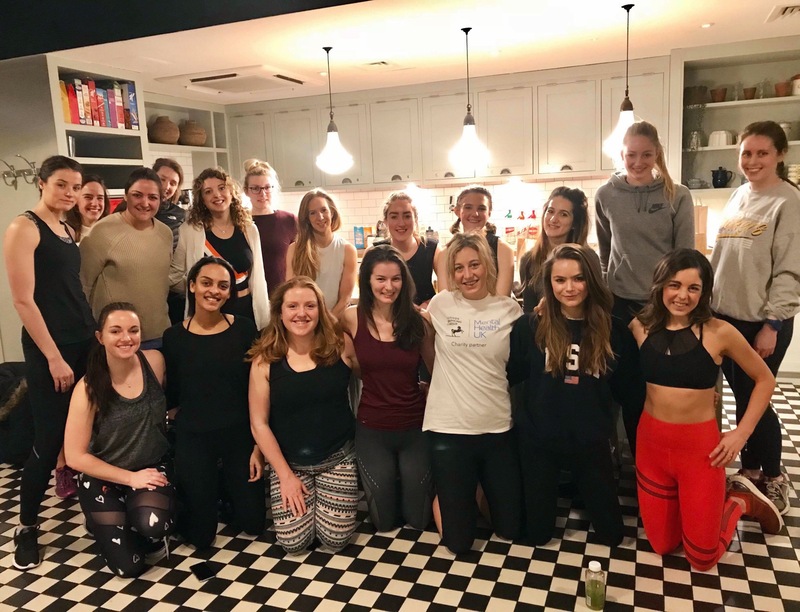 This event was all about feeling good – with an upbeat, energetic barre class followed by a delicious, nutritious brunch. Barre was held in the uber cool ‘Apartment’ within The Hoxton hotel in Shoreditch; a super stylish space I’d like to inhabit, please! With our M Life London eco mats and resistance bands, we worked through all major muscle groups for a full body burn, before finishing with a relaxing stretch. Following refreshments from PRESS London and Seedlip, we were fired up for a feast. We moved into the conservatory within the Hoxton Grill for a buffet brunch with pancakes and blueberries, hemp seed chia puddings, avocado and roast tomatoes on sourdough, mozzarella and beets spelt salad and platters of fruit. I am getting SO hungry just listing that out! Thank you so much to all of those that attended to plié, pulse and eat pancakes with me – I hope you enjoyed it. I absolutely loved seeing lots of new faces alongside some more familiar ones and hope to see you again soon! Find out more about my upcoming events here.